Find a vacation home to rent in Vinje Municipality from our list of vacation rental properties. Campaya has over 13 vacation homes available in Vinje Municipality, which give you the possibility to locate a unique accommodation in Vinje Municipality which completes your check-list in search for the perfect self catering vacation apartments in Vinje Municipality or vacation villas in Vinje Municipality. In this large, extreme well equipped luxury cottage, located on the 'roof of the Telemark', you have all kinds of comfort & wellness. This beautiful holiday house is located in Rauland / Vierli, on the foot of Hardangervidda National Park and can accommodate several families. Welcome to a beautiful cottage in magnificent terrain. The cottage is well located on a sunny plot in the scenic area of Rauland. Very nice and well equipped cottage in a fine situation 20m from Tveitevatnet lake. From the holiday home can you enjoy a beautiful panorama view of the lake and the hills beyond. Vacation home with ski-in/ski-out. This is in the bull's-eye for all who love mountains and outdoor activities. This cosy small house is built in traditional style and is located just 50 metres away from the downhill facility in Rauland with 26 slopes and numerous cross-country trails. This is a cosy holiday home in Rauland. As Hardangervidda is located nearby, this home is a perfect starting point for an active holiday in summer as well as in winter. Lovely house in the style of an old farmhouse with wood furniture and a grass roof. Long white sand beach. Close to activities in Rauland and Rjukan. Holiday home perfectly placed in Rauland, Telemark. 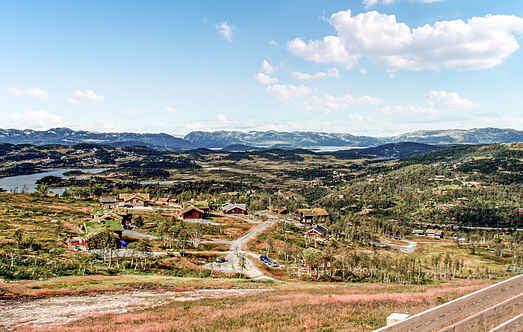 The home is situated on a sunny plot with stunning view over the Norwegian mountains. This is a cosy holiday home in a fine location on the tree line. There are some low ceilings in the open loft and limited internet speed. Lovely cottage with all amenities and good quality on a sunny plot in the picturesque area of ​​Rauland. The cottage is a real mountain cabin with a sauna. Great cottage with all amenities, and good quality throughout on a plot with good sun conditions in the scenic area of Rauland.